H4 EAD news update today: Some users spotted that OMB review page shows a scheduled meeting on May 1, 2019. There is no publicly available information about this meeting’s purpose and how it affects H4 EAD. Federal court has not given any of their view and next hearing is on April 29, 2019 when SaveJobsUSA will present their part of story. Earlier, DHS informed Federal court on Apr 1, 2019 that H4 EAD program does not affect job competition in US job market! This is good news for 100k H4 EAD workers and holders as DHS has not found H4 EAD’s negative impact to American workers in their economic impact study! This could be a big blow to SaveJobsUSA argument and lawsuit’s basic premise. The acceptance that H4 EAD does not affect jobs is a win for H1B spouses and might be a hint that DHS may have something good for H4 EAD in their kitty. Only time will tell. DHS submitted the revoke rules to OMB for review on Feb 20 and marked it as ‘Economically Significant‘ which means that OMB might wrap up comments period within 30 days. Join us on WhatsApp Group 5 – (Group 4, 3, 2 and 1 are full at this time. ), Facebook Group, Twittter, Truvisa.com or Telegram Group for latest updates, questions and answers. H-4EAD Status – Is H4 EAD Still Valid? You CAN apply for new H4-EAD and H4-EAD renewals at this time. USCIS is issuing H4-EADs and you can apply 180 days before your current H4 EAD card expiry. Will existing H4 EAD be Valid after DHS Revocation? It is expected that DHS will allow to use existing H4 EAD cards to run through their validity. 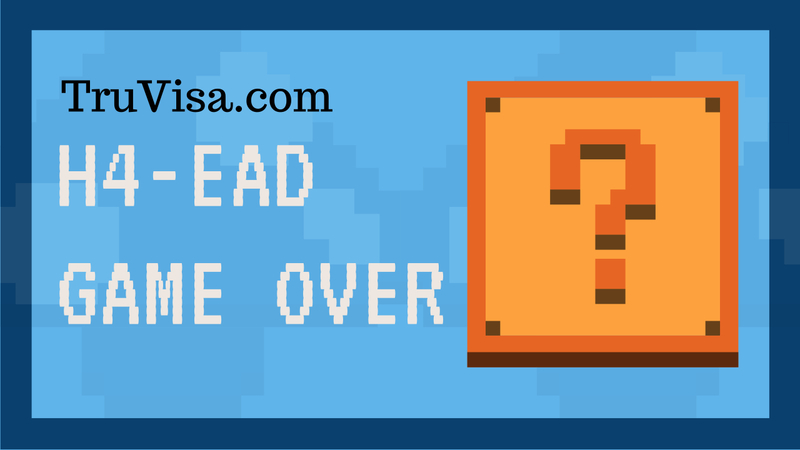 USCIS will stop the new cards and the EAD renewals. 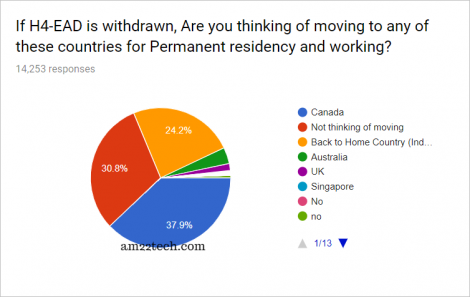 The survey’s 14K responses reveal that H1b skilled people are getting ready to get Canada or Australia PR. Find the mood of H1B, H4EAD community. Google account required to fill survey. See results after you have filled your own responses. No email collected. No spam. Your response remains anonymous. Open H4 EAD withdrawal survey in a new window. Feb 20, 2019: DHS submitted H4 EAD revoke rules for OMB review. Dec 27, 2018: Immigration Voice Appeal Request Accepted in Federal Court. Federal court decided to start case hearing again and stop waiting for DHS to remove H4 EAD. The court case is against DHS allowing H4 EAD to work which DHS did not contest after Trump came to power. Now, this appeal is contesting and want to argue in favor of H4 EAD. Ideally, this should have been done by DHS! So, if court agrees to appeal in favor of H4 EAD, immigration Voice may win the case and then H4 EAD removal may be put on hold. Only time will tell. Dec 21, 2018 – H–4 Employment Protection Act of 2018 introduced by California Congresswoman (Eshoo, Lofgren). H.R. 7150 bill aims to protect H4 EAD work permit from DHS removal. The chances of HR 7150 becoming law are very low at this time even with Democrat majority in house. Sep 26, 2018 – U.S. Senators Kamala D. Harris (D-CA) and Kirsten Gillibrand (D-NY) letter to USCIS. USCIS reply (on last page) – Oct 16, 2018. Sep 21, 2018 – DHS informed the federal court about completion of rulemaking work and rules pending USCIS review. Sep 17, 2018 – SaveJobsUSA files motion in Court to continue with the case as DHS is taking too long to publish rules for H4 EAD withdrawal. Sep 6, 2018 – USCIS replied back to Internet Association confirming their stance of no backing off. Aug 23, 2018 – Business Roundtable sent an official letter to USCIS in support of H4 EAD is signed by Apple, ADP, American Airlines, Pepsi, Coca-Cola among other CEOs. Aug 22, 2018 – Internet Association sent a letter to USCIS requesting a re-think on their H4 EAD withdrawal rule. Aug 20, 2018 – DHS to Federal Court – No intention of backing off on H4 EAD withdrawal. May 19, 2018 – USCIS started issuing RFEs for filing renewal before 120 days. USCIS officially allows filing H4 EAD renewal 180 days before expiry (Refer: USCIS EAD Rules and EAD) and the H4 EAD 120 day RFEs are not justified. New H4-EAD renewal applicants have confirmed that they are able to get H4 EAD renewed even when filing 180 days in advance. May 16, 2018 – 130 bipartisan congress members sent signed letter of support in favor of H4-EAD to USCIS. 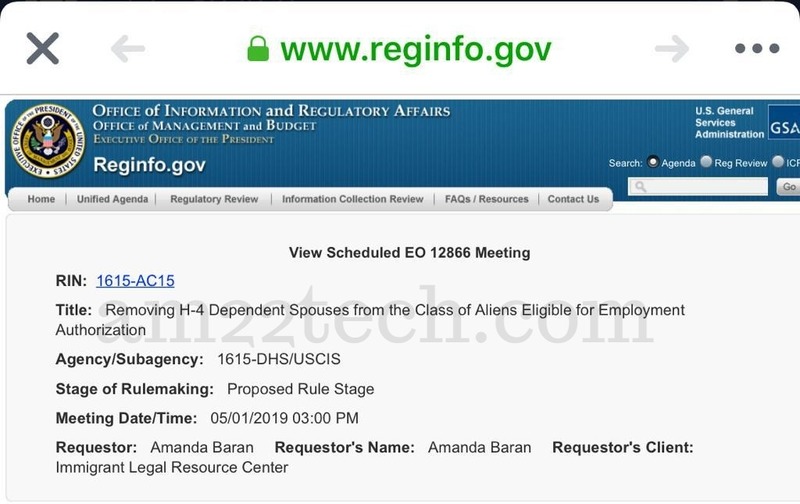 DHS is actively working on making rules on removing H-4 Dependent Spouses from the class C(26) of Aliens Eligible for Employment Authorization (EAD). Marked as ‘Economical Impact and Significant’ rule, DHS has the legal obligation of giving only 30 days for public comments instead of longer 60 or 90 days! My case is a little bit different. I’m on COS H4 pending status and I have submited the H4 extension + H4 EAD with my husband’s H1 extension together under PP. My husband’s H1 got approval yesterday. I konw people usually get the H4 extension + H4 EAD approval together. Should I expected to recieve the approval soon? Or my COS H4 will take times? Thank you! Your H4 COS should be approved first to get an approval for H4 Extension. My wife’s H4 EAD is valid till September 2019. What documents do I need to submit for her EAD renewal. My company has submitted my H1b extension via premium processing. Is there a website where I can find the document list? I heard that there is a new biometric requirement now. Documents required for H4 EAD renewal. The new Biometric requirement is for H4 extension. Lol….. You guys are still believing this. H4 EAD is a political faux. It will not be removed. I said this earlier. 2020…. You will still be looking at this blog for time lines. Lol……. Very simple solution that will be a win-win for both sides. Rather than revoke H4 EAD’s – DHS should make it available only for Highly skilled workers (similar to H1B). For example, set a prevailing wage. Make a Job offer mandatory to receive an H4 EAD and also make it mandatory to submit all documentation similar to what are needed when applying for an H1B. If needed, make it mandatory to get a job in the field of study (similar to what is necessary for F1 EAD). This will ensure only the best and deserving get the H4 EAD. I have my H4EAD valid till Feb 2020 but now my husband is doing an H1 transfer and my H4 extension based on new petition. say if I get a new H4 with validity till 2022, can I file for H4EAD extension based on new H1/H4 before 6 months before expiration of my old H4EAD? You can file H4EAD extention before 180 days only if you file H1B+H4+H4EAD together. Otherwise, you will have to wait till your reach 180 day mark. My spouse got H4-EAD and SSN in Dec-18. I used ITIN for last few years tax-filling, Now she got SSN so I should be using her SSN instead of ITIN for 2018 tax filling ? is ITIN cancel automatically once SSN issued with EAD? she did not have any income in 2018. Any suggestions. Please let me know right forum if this is not correct to ask such questions. Your question about H4 EAD ITIN and SSN has been added to out form and answered there. Can H1B Extension + H4 Extension + New H4EAD application be filed together under premium processing? Will they process these 3 in premium? You can file all 3 in premium at the same time but chances of H4 and H4 EAD approval in 15 days are low as there is a new H4 Biometric requirement that started on mar 22, 2019. Thank you. If its not processed in 15 days, does it mean it’ll go to regular processing and take 6 months? Or after getting the biometrics they would expedite it? There is no data to say if the H4 will be processed in premium after biometrics yet. Your question is out of scope of this article. Please ask in forum. On one hand DHS says that H4 EAD does not impact American workers in a report filed yesterday, April 2. It requests the federal court to dismiss the case vs save jobs USA. On the other hand, DHS has submitted H4 EAD revoke rules to OMB. How is this possible? If its not impacting American jobs, why would they want to revoke? It’s confusing. Any thoughts will be appreciated. I think they just want to get rid of lawsuit. The H4 EAD removal decision is politically motivated by Trump administration. But their statement saying “H4 EAD does not affect US workers” can be used against them if someone files a lawsuit to save H4 EAD or during public comments window after the revoke rules are published? This is a positive news for H4 EAD holders as this shows that DHS and government may not find it easy to remove H4 EAD. At this time, DHS’s only argument to revoke H4 EAD is that H4 EAD should have been given by congress law and not by an executive order. Got it.. Thanks for the quick response.. Some breather for all of us I guess. It is an irony as per my knowledge, the Buy American Hire American under which pretext the H4 EAD is being rescinded is itself an EO? A. These regulatory actions are a subset of those designated by OIRA as significant. A regulatory action is determined to be “economically significant” if OIRA determines that it is likely to have an annual effect on the economy of $100 million or more or adversely affect in a material way the economy, a sector of the economy, productivity, competition, jobs, the environment, public health or safety, or State, local, or tribal governments or communities. For all “economically significant” regulations, the Executive Order directs agencies to provide (among other things) a more detailed assessment of the likely benefits and costs of the regulatory action, including a quantification of those effects, as well as a similar analysis of potentially effective and reasonably feasible alternatives. Thanks for sharing. I will check it soon.